Junkers started the developement of a jet engine design in 1936 at its Magdeburg facilities. At the same time in Dessau several developement studies were performed, regarding the correct design of jet aircraft. One developement group concentrated on the design of high speed fighter aircraft, while the other was focused on the design of combat and bomber aircraft. The initial studies were concentrated on a jet fighter and record aircraft design, as the new jet engines allowed higher speed maximums than the classic piston engines. All fighter and record aircraft designs were cantilever monoplane designs with retractable undercarriage. They mostly differ in the way of the engine mounting. A major lack of all of these designs was the small operating time. A flight time of 6 minutes or a range of less than 100 kilometers, like the EFo018, was not adaquate for a typical fighter mission, but just useable for object defense missions. Even 15 to 30 minutes just offer a range of maximum 400 kilometers and was not enough for the later air combats with hundreds of enemy bombers over Germany. 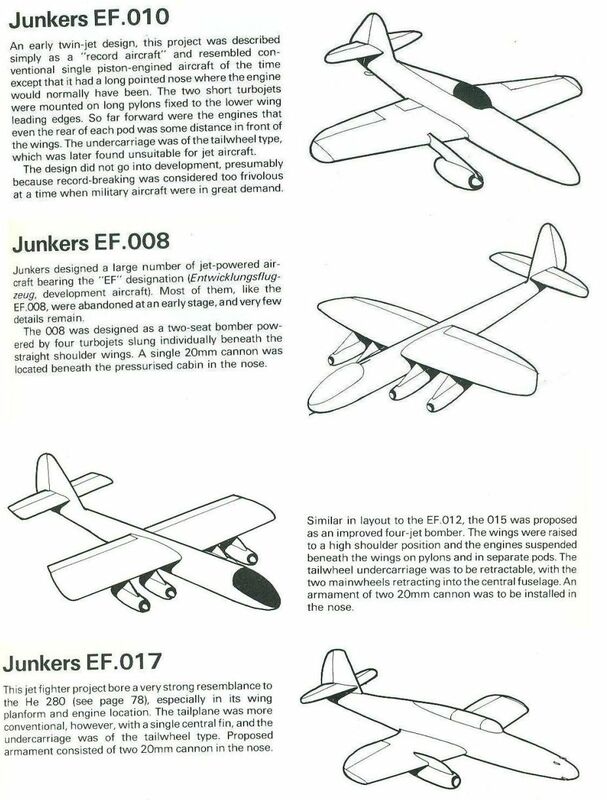 All of these early Junkers fighter designs were more in the area of the later Messerschmitt Me163 than of the early jet fighter of Heinkel and Messerschmitt Me262. The second approach headed for a high speed bomber design, which could also be used for high altitude missions. These designs were highlever monoplanes with four jet engines and two seats. The initial design of the EFo 008 was a high altitude bomber, which should be operated at an altitude of about 6500 meters with a speed of 810 km/h. The maximum altitude was designed for 12000 meters, which was not reachable by any prop aircraft at this time. The cabin was pressurized. The range of 660 kilometers was very short and therefore this aircraft just could have been used in the near of the front lines. 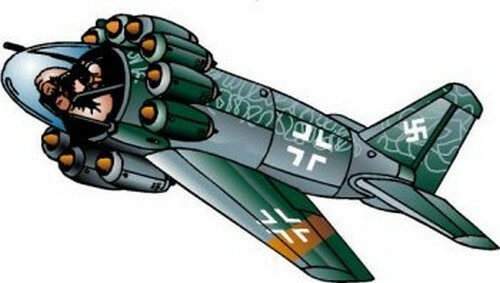 However, this was the strategy of Luftwaffe in the second half of the thirties. The EFo 012 was designed in 1939. This aircraft is again a high altitude bomber. The speed was increased on this design to about 750km/h and the range was extended to 1100 kilometers. For aircraft defense two remote controlled machine guns were installed. 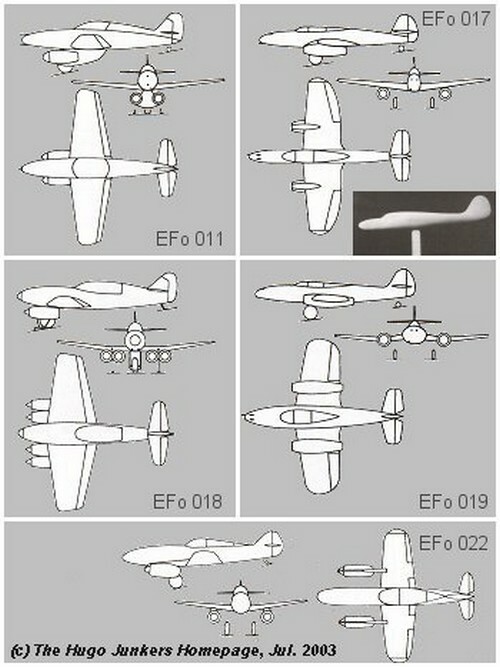 The final known bomber study was the EFo 015. This design returned to the classic EFo 08 design with the improved data of the EFo 12. At the mission altitude of 6000 meters this aircraft was able to reach an operating speed of 770 km/h. The range was designed for 1200 kilometers. Two fixed machine guns were installed in the nose section. The EF009 was a fighter aircraft with four jet engines under the fuselage plus additional six pulsojet engines in front of the nose section. It was a vertical take off aircraft, which started from a ramp. Probably the pulsojet engines were used for a maximum climb rate, while the jet engines were used in horizontal flight. The pilot was laying in the aircraft. The aircraft had only a few minutes of flying time. The EFo 009 was able to reach about 850 km/h and a climb rate of 77 meters per second. The landing was performed on skies. It was especially designed for short defense missions of local objects. The EF018 had 2 x two tandem jet engines also under wing A special feature was the single main wheel undercarriage under the fuselage. 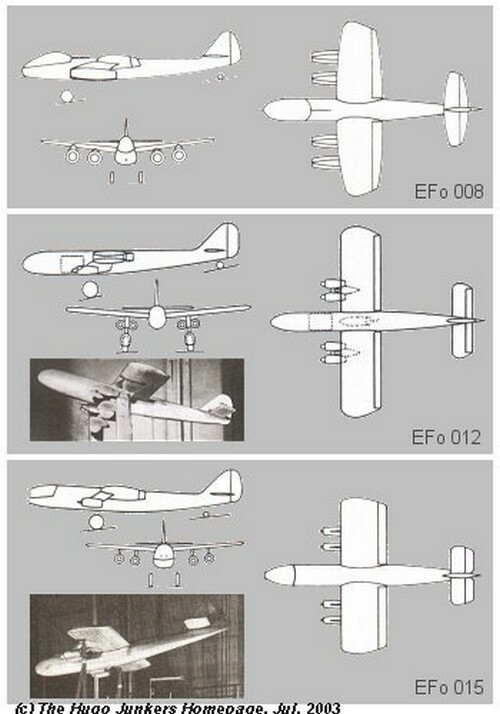 The EF018 was a special mission aircraft for short defense flights of up to 6 minutes. However it is unclear, if this aircraft was a failed design of the fighter developement group due to its short range or if it was originally designed as an object defense aircraft.